Oil trading just slightly lower this morning following an inventory report yesterday that did little more than confirm market expectations. Crude took a hit yesterday, falling back roughly a dollar from the previous day’s close, and over $1.50 below Friday’s close above $55/bbl. Crude oil this morning is trading at $53.54, hardly changed from Tuesday’s close. Fuel prices also eased gently yesterday, with both products losing around a penny. This morning those light losses have turned to relative lack of movement. Diesel prices are trading at $1.8957, down just 0.2 cents. Gasoline prices are $1.4273, up a miniscule 0.1 cents. 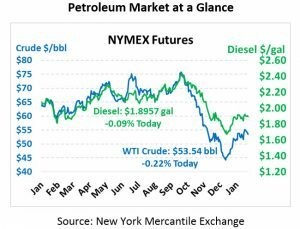 Yesterday’s API report was of little interest to the market, outside of a very slight build in diesel stocks (against an expected 1.8 MMbbl draw). Markets are waiting for this morning’s EIA report to confirm this week’s data. The State of the Union address came and went, relatively benign from an energy standpoint. Trump touted America’s status as a net energy exporter, which technically was true for one week in December 2018 and is expected to become an on-going reality as early as 2020. He also pointed towards America’s recent ascent to being the largest oil producer in the world, surpassing Russia last year. Trump’s focus, however, was on the economy and border security, so the effect on markets was minimal. More important to oil markets this morning is on-going volatility in Venezuela, where production continues falling amid US sanctions. PDVSA is expected to take 300 kbpd of production offline as they struggle to find naphtha, a light oil element typically exported from the US to help Venezuela’s viscous crude flow more readily. Beyond losing a key customer, Venezuela has lost a major supply partner, further limiting their ability to convert oil into much needed cash. Sanctions have helped buoy prices in the last week, lifting them from the low $50’s to above $55 last week.